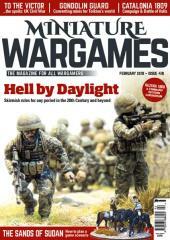 #418 "Hell by Daylight, To the Victor, Gondolin Guard, Catalonia 1809"
FORWARD OBSERVER: What’s up and coming in (mostly) historical wargaming with reports on Warlord, Rubicon, Deep Cut and Caliver Books. SEND THREE AND FOURPENCE: Part two of Civil War UK ‘79: Scenarios for Black Ops. HELL BY DAYLIGHT: Part one of a set of rules for 20th Century Skirmish gaming by Jim Webster. THE SANDS OF THE SUDAN: Starting a new period with a scenario and rules suggestions. COMMAND DECISION: Can you get the troops home and safe? A commanding conundrum by Jon Sutherland. DRAGONMEET: A trip to the London gaming show. FANTASY FACTS: The usual holo-deck experience of the latest news in F&SF gaming with releases from Black Pyramid, Brigade, Slave2Gaming, Antediluvian Miniatures, Osprey and Outlaw Miniatures. GONDOLIN GUARDS: Conversions and painting in the First age of Middle Earth. CATALONIAN CAMPAIGN: Napoleon in Spain and the Battle of Valls: introducing the Powder and Sword rules. SIX ADDICTION: Can Andy Copestake make good decisions in his gaming? No dice!